Hi The only thing good about this hotel is its proximity to the railway station. The rooms are okay nothing great,torn bedsheets. The hotel staff is too nosy. Be careful of the bathrooms as there are peeping toms who watch you from the duct opposite the bathroom window. The restaurant serves only veg food with limited options. It's is highly priced due to the proximity to the refinery. The hotel positions itself as a 3 star. However, the appearance does not correspond to the content. Dirty mattresses and pillows. Torn sheets. Service is simply terrible. Very noisy in the evening. The restaurant is only vegetarian. Credit cards are not accepted. In my opinion, this hotel is even 1 star a lot. It is a nice hotel near Bina railway station. Cleanliness is worth appreciation. Service is very quick. Staff very cooperative. Ample parking is available. Considering Bina being a small town, efforts of hotel management for maintenance of standard is excellent. If you are planning your visit in winter season then don't select this hotel; from morning you will have to take heavy follow up for one bucket of hot water. Staff was not skilled but helpful sometime. Restaurant most found empty ; if you don't have any option then only prefer to stay here. First, let me start by recommending that you should avoid staying at Bina, if possible. As for me, I did not have a choice. I chose this property as I was told this was best in Bina, which is not much. Bina is one of those dusty small industrial towns, where anything goes for hotel. 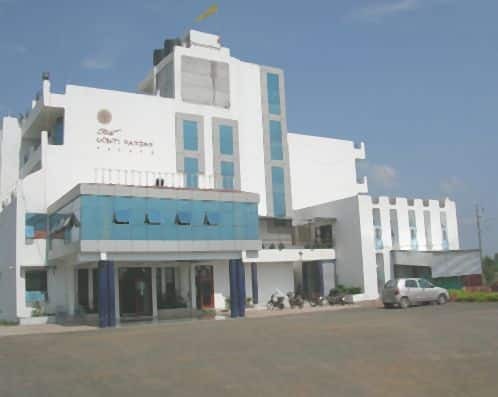 The hotel provides a chargeable airport pick up from Bhopal airport, which we availed. The Innova that picked us up was average in terms of cleanliness considering the fact that it came Bina. The drive from Bhopal airport was 3 hours. The road quality was mostly good, but much of it did not have a road divider. The first thing that you see when you enter the hotel is a couple of bust size statues of average artistry - probably that of deceased parents of the hotel's owner. The hotel has a very nice attached lawn that must be used for parties. Ample parking space in front of the hotel too. The reception area is spacious, but largely empty. The lift is rickety (yes, there is a lift). The rooms are sparsely appointed. The television channels are limited (mostly local channels), and the room refrigerator is noisy. The bathroom was reasonably clean for the standard of the hotel. It even had a health faucet. I visited the hotel in December, and the room was very cold. They did not have a room heater, and offered an extra blanket instead. The blanket was dusty and smelly. I did not sleep well that night. To my surprise, the hotel accepted all major credit cards. I could even pay for my pick up and drop using my credit card. Breakfast was average; not much options. This is a vegetarian hotel. However, the staff were very courteous and helpful in their own way. Not very professional, but they tried to please us during our stay. On conclusion, if you have to stay at Bina this is the closest you will ever get to luxury. Get enough warm cloth for bed if you are traveling during winter. Book in prior. Choose executive or deluxe rooms. I hit the pool button by mistake. I didn't see any pool. I think I had the executive room on the top floor. As good as it gets.